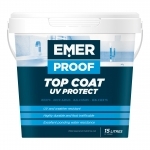 Emer offers the complete decorative and protective coating system solution including concrete repairs, sealants, waterproofing and membrane coatings. A new Emer range website is currently under construction. In the meantime you can find details of our full Emer range below. If you need further assistance please contact the Parchem Customer Service team on 1300 737 787 or sales@parchem.com.au. 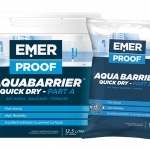 The Emer-Proof system is a range of waterproofing products ideal for balconies, podiums and soil contact surfaces. High performance water based rubberised bitumen waterproofing membrane with root penetration inhibitor. Highly flexible Class III, water based polyurethane waterproofing membrane. Water borne epoxy membrane and barrier for porous surfaces. Fast drying single component primer for porous surfaces. Emer-Clad is a decorative and protective membrane facade coating system. 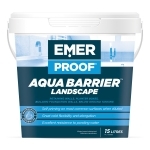 The Emer-Clad system can be applied to a wide range of substrates including concrete, render, masonry, fibrous cement products, metals and timber. 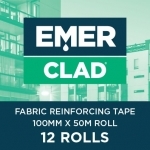 Emer-Clad Preparation Patch Repair is for concrete repairs where its light weight nature and high build characteristics makes it ideal for vertical and overhead repair work prior to the application of Emer-Clad Facade top coat. Cementitious fairing mortar (0mm to 3mm thickness) to cover concrete surface imperfections. Emer-Clad Preparation Skim Coat is a cementitious fairing coat designed for application in thin layers to cover surface imperfections on vertical concrete or masonry surfaces prior to the application of Emer-Clad Facade. It can be applied to infill surface imperfections up to 3mm thickness. 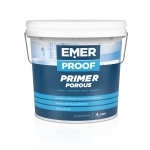 Water based primer for porous surfaces. 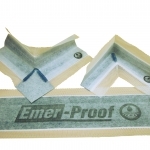 Provides an even non absorbent substrate over which Emer-Clad Facade can be applied. 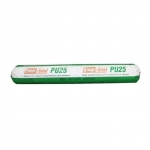 Suitable for a wide range of porous surfaces such as concrete, masonry, brick, cement sheeting, blueboard and plywood. 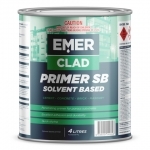 Penetrating, solvent based, clear masonry and concrete primer. 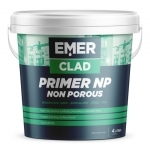 A water based primer for non porous surfaces such as galvanised iron, steel, zincalume and PVC. Emer-Clad Facade, is highly flexible and has excellent resistance to aggressive elements including UV, weathering, chloride ion and carbonation attack. 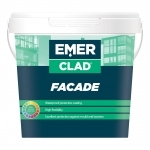 Emer-Clad Facade is suitable for application to many common substrates including concrete, render, masonry, fibrous cement products, metals and timber. Some special priming may be required. Non woven fabric designed for use with liquid membrane and high build coating products for enhancing reinforcement, tensile strength and uniform layers in liquid membrane applications. Suitable for both vertical and horizontal applications, the tape displays outstanding workability and provides excellent rupture and rot resistance. UV resistant paintable joint sealant based on silyl modified polymer technology. High performance, flexible, one-component, polyurethane joint sealant for sealing joints in concrete panels, fibrous cement products, external cladding panels, blockwork and brickwork. Also suitable for sealing joints around aluminium and timber door and window frames and between metal. And suitable for sealing sawn joints up to 10 mm wide in concrete floors and pavements.